In the monthly meeting of Climate Change Working Group (CCWG) on January 10, 2012, a representative of DARA International announced the results of the Climate Vulnerability Monitor study on Viet Nam’s specific case. According to the report, every year climate change costs Viet Nam 5% of its Gross Domestic Product (GDP), equivalent to US$14 billion of the 2010’s GDP of US$280 billion recorded by DARA. The total economic cost was forecast to rise to 11% in 2030, which might equal to US$165 of the estimated US$1.5 trillion GDP. Viet Nam is assessed as having acute multi-dimensional climate vulnerability. Every year, due to climate change, production cost rises US$8 billion, the fishery sector incurs a US$1.5 billion damage, agriculture loses US$0.5 billion, flooding and landslides cause damage of US$200 million and US$150 million arises as costs for cooling due to rising temperatures. The report addressed Labor Productivity as the most significant impact of climate change on Viet Nam, and also globally, especially in relation to heat stress, resulting in over 4% GDP in 2010 and up to 8.6% GDP in 2030. “The country’s policy stance on climate change is path-breaking for one with low-emissions and limited responsibility for climate change experienced to date.” the report reads. This was also one of the purposes for the study to be specifically researched in Viet Nam. 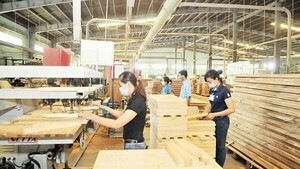 Viet Nam has committed substantial government mobilized funds to tackling climate change, with the first major national policy framework committed over US$50 million coming from domestic resources, in particular to respond to the impacts of climate change, initiated by the Ministry Natural Resources and Environment in 2008. In 2012, the country launched its “National Climate Change Strategy” (NCCS), which covers a range of vulnerability and low-carbon issues. Experts also noted ongoing inquiry by the Vietnamese Ministry of Labor – Invalids and Social Affairs (MOLISA) into climate change effects. However, the Monitor’s assessment in this report suggests that there is still further scope for enhancing these policies. “Opportunity should also be taken to help those remaining vulnerable communities to become more resilient through programs such as education campaigns or encouraging the use of agro-insurance. […] taking advantage of technology transfer and financing through the Clean Development Mechanism will all help maximize economic, social and environmental benefits,” the Monitor reads. Climate Vulnerability Monitor program is considered the most comprehensive assessment of the current global impact of climate change, estimating human and economic impacts for 184 countries in 2010 and 2030, with the participation of over 50 leading scientists, economic and policy experts. The field-based research in Viet Nam was a joint effort between DARA and CCWG, conducted mainly in Ben Tre, Yen Bai and Ha Noi in 2012, using in-depth interviews with stakeholders as its methodology./.